Good afternoon TmoNews readers! Today is a very important day for RIM (Research In Motion). 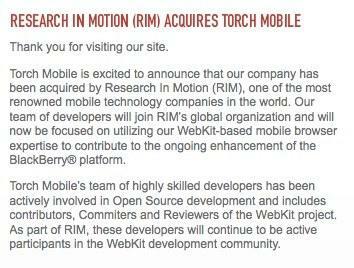 RIM has officially acquired Torch Mobile. You know the developers behind the WebKit-powered Iris mobilebrowser. As you may already know the famous iPhone/iPod Touch Safari browser also use mobile WebKit. Not to mention the Android web browser also uses WebKit. So this could really help Blackberry devices acquire a decent web browser. And we might even see this new web browser on the upcoming T-Mobile Blackberry Driftwood. Sound off in the comments or feel free to discuss in the forums! UPDATE: The guys over at WMExperts.com contacted Torch Mobile who replied that the company will no longer be developing for Windows Mobile or Windows CE.